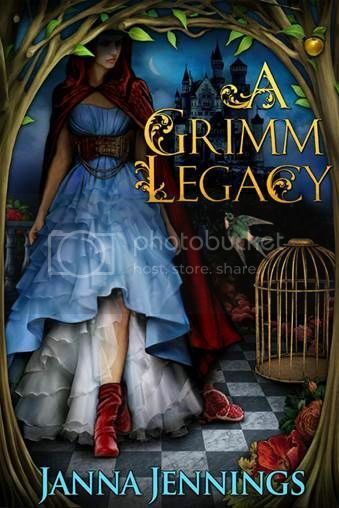 Welcome to the A Grimm Legacy blog tour hosted by Patchwork Press! Today I welcome Janna for a guest post! Let's see what she has to say! But let’s face it, I feel like others have far wiser words to impart. So I’ll stick to what I think might be most helpful for those starting out down the writing/publishing road: how in the world did I get here? Almost any other author I know has been writing since childhood, or always had this burning desire to write, or had a story that just had to get out of their brain an onto paper. I had always loved school and learning about anything and everything. (Except math! I managed to earn two degrees without setting a toe inside a math class. Alas, I needed Statistics for my Master’s degree. A perfectly good seven-year no-math-class-streak ruined.) And in the aftermath of 20 or so years of straight school, my brain was bored. I kicked around the idea of writing almost two years ago, mentioning it to no one but my husband. The good man that he is, he gave me the little push I needed to get going: a brand new iPad and several writing books. Now I had to give it a try or risk looking foolish. What I discovered is that I’d rather write than do almost anything (and it was certainly more enjoyable than going to work). I worked about 6 months on the manuscript that eventually turned into A GRIMM LEGACY. I found the wonderful website of NaNoWriMo and participated in what many of you are now in the final throws of: the 50,000 words in 30 day challenge. Through them I found a few fellow writing armatures that were willing to give me feedback. I borrowed books from the library on writing and tried to apply what I learned to my work, and I generally got little bits of help from anywhere I could. Then I figured it was time to query my work. I slaved over my query letter and sent my baby out into the world. And basically fell flat on my face. NO ONE was interested. I knew my manuscript needed something, but I had taken it as far as I could on my own, and was at a loss of what to do. So it got shelved. And I kept writing but I worked on other ideas, I started what will now be the second in the Grimm Tales. What turned things around was a contest run through some fellow NaNoWriMo participants. Professionals in other areas of the writing world were offering their services to one lucky NaNo winner to give them a leg up in self-publishing. I was that lucky winner. Lucky being the key word. Kellie at Patchwork Press had offered up the marketing portion of the prize, and she extended me an invitation to join their fledgling group, and the rest is—as they say—history. I’m learning that my experience was a unique one. Most people invest hundreds of dollars into their independently published projects. Cover design, editing, formatting, and marketing all take money to have it done well, to make it your work professional. Because of the way PWP runs, they not provided all this, they educated me in the ways of the publishing world along the way. I feel strongly about my book. I think there was a nugget of talent and engaging story telling in it from the start. But I also realize I was just in the right place at the right time, because I’m not so delusional that I don’t know the finished product is so much more than I could have accomplished on my own. I wish this post would have been more of an, “If you do this, this, and this, all your writing dreams will come true.” If there were a formula for how books get published, I probably would never have figured it out anyway given my dismal math skills. But hopefully one more success story will give you the motivation to keep plugging away. Thanks so much for stopping by today, Janna! So great to have you here!